The Denver gunbelt with holster is border tooled with a 2 1/4" belt. This gun rig is made for small to medium frames, specifically for single or double action revolvers. Available in straight left or straight right. Color choices are Black, Brown and Natural. The holster is made of two pieces of 4-5 oz. leather, laminated nap-sides together so the smooth side is out. This process gives the holster more strength and durability. 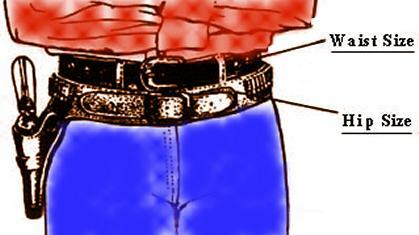 The gunbelt is made of 9-10 oz. leather with smooth smooth leather lining. The entire rig is has nylon stitching for durability and comes with a silver buckle.